Ildrecca is a dangerous city, if you don't know what you're doing. It takes a canny hand and a wary eye to run these streets and survive. Fortunately, Drothe has both. He has been a member of the Kin for years, rubbing elbows with thieves and murderers from the dirtiest of alleys to the finest of neighbourhoods. Working for a crime lord, he finds and takes care of trouble inside his boss's organization - while smuggling relics on the side. Some debut books get hyped to the point of ad nauseam and others seemingly appear out of nowhere. 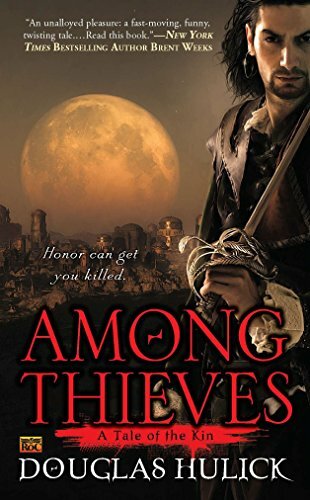 Among Thieves by Douglas Hulick falls in the second category with hardly any word being spread before its release except a few cover previews deriding the US cover. After finishing the book I find the cover to be very fitting albeit overly romantic. The sepia coloring of the background is a big nod to one of the unusual abilities for one of the characters, which makes it work. Among Thieves deserves a lot more attention as Hulick has gifted us with one of the most exciting debuts in years and as of this moment it has earned it's place as my favorite debut of the year. I've always had a soft place in my heart for rogues and scoundrels and Hulick has created a scoundrels' scoundrel and one I hope to see a lot more of. 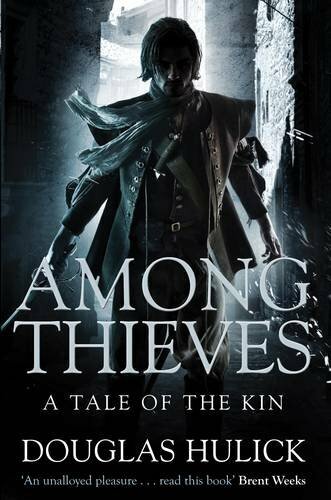 Among Thieves stars Drothe who is as deep as someone can get in the underworld. Drothe is as amazing as the city he inhabits, each containing depth and detail to get lost in. Drothe is a Nose for a local gang. Terms like Nose take some getting used to as they're derived from the Thieves Cant, which is the vocabulary/lingo of the underworld that the author has adapted for his story. A Nose is a man who makes it his business to know everyone else's while sharing it with others for a price. Some are Short Noses like Drothe working for one boss while others are Broad Noses who sell the info to the highest bidder. There is a lot more to the cant that really makes the world come alive. The story gives you the most intimate feeling for the lifestyle of criminals and how the smart characters play life like a game of chess moving and pushing pieces without their knowledge. If you don't like your main characters doing dastardly things than Among Thieves is not for you, but if you like capering, plotting, and a bit of torture you'll be caught up from the first page. There is also a fair amount of drug use, but it isn't overly insidious as I've seen in other works. While the action is well done it is Drothe's dialogue that keep you pushing forward as it is effused with dark humor. Nearly perfect with its execution, Among Thieves is a twisty journey full of intricate layering and unanticipated surprises. Just when you think it can't get any deeper Hulick drops you in a sink-hole that will leave you stunned. Don't rush through the book as you could easily miss important connections that will help you from falling off the path. The pacing is perfect with lots of high-tension. This is a world rich in history, characters, and intricate capering that will leave you breathless and gasping for more. As Drothe tours you around to different parts of the city and the cultures it contains it becomes a living breathing place filled with well drawn characters and diverse cultures. I do wish Drothe's own personal family history was explored a bit more yet Hulick has left the door open for a lot more including his scheming sister. Without any hyperbole I believe Douglas Hulick is the best debuting author Roc has premiered since Jim Butcher. Get in on the ground floor because Douglas Hulick is going to be a star for many years to come and Among Thieves is the gateway to his world. Fans of Scott Lynch should not pass this up. I give Among Thieves 9 out of 10 hats. While Among Thieves stands alone quite well it does set things up for much more. The sequel Sworn in Steel should be out in April 2012 - be prepared! Ha, when you gave me a copy of this at my birthday, I figured you were just cleaning off your bookshelves. A 9 out of 10 is pretty impressive though. Ha, no I bought it for you on purpose. Not much more I would add other than to chime in with another opinion about how awesome this book is. Get it! I'm having the worst time trying to leave a comment today lol. Was just going to leave a quick comment about how awesome this book is and not much more to add other than fantasy fans should definitely read it! One of the best books I've read in awhile. I think you recommending it to fans of Scott Lynch is spot on, as it does have the same sort of feel as the Gentlemen Bastards series does. I also think that Drothe has a bit of the same character voice as Vlad Taltos. Interesting connection about Vlad Talos. I tried to start the first book a couple years ago and stopped after a few pages. I should pick it up again if it is anything like Among Thieves.